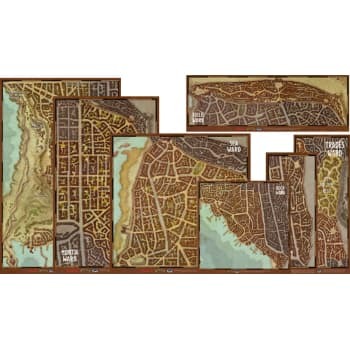 Discover the wards of Waterdeep with this set of Maps designed to immerse your party into the City of Splendors. Featuring seven overscale maps, perfectly designed for your tabletop, these maps allow your adventurers to see all the wards of the city in all their glory. Printed on high-quality single sided vinyl surfaces, these maps are durable and hard wearing, allowing you to revisit the Crown of the North whenever your party needs to.